Its that time of year again where there is so much mess, chaos and noise that you can’t think straight and start wondering if you’ve burnt the food for the first time all year – Christmas day. The glory of our so much celebrated holiday. Its been a dreary day where I live, along with all the chaos and running around just like that turkey in the over…headless…ah but we’ve survived and alas, the house is silent and a well warned rest with hook or needles and some tasty, tasty yarn can be had. Which is exactly what I’ve been doing. Today I picked Sophie back up. Oh how I’ve missed her…remind me not to put her down again until I’m done. I ha e also been working on other projects, as you all know most recently I completed an evil minion commission and then started the kitty cat tote. Well in good old fashioned me style, I’ve also started another minion blanket but this time its a regular yellow one made in squares to look like a retro 8 bit gaming character. Once I have some more done I will show you all some photos. However, back to Sophie for a little while longer this evening. All happy season greetings and whatnot to those who prefer yarn over….well, most things really haha. I have now just finally got round to actually sitting down and using my laptop (instead of my phone, which is sometimes a rotten thing to do) so I can officially announce that the beautiful Bessie V from Shells and Bobbles has nominated me for the Liebster Award! Thank you my darling, thank you 🙂 things like this is what makes the world a wonderful place to live in. Make a post thanking and linking the person who nominated you. Include the Liebster Award sticker in the post too. Ensure all of them have fewer than 200 followers. Answer the eleven questions asked to you by the person who nominated you, and make eleven questions for your own nominees (or use the same questions). Who or what is your crafting inspiration. – I can’t really say…I guess I remember my grandma always knitting a crocheting and sewing, but never thought anything of it, even though I dabbled a bit at the time, but a handful of years ago, I got the major itch. Where would you go on your dream holiday? – anywhere! Haha I haven’t really been on a ‘proper’ holiday so somewhere warm and wonderful as I’m not a massive fan of the cold…although it would be nice to stay in a log cabin, with a fire in the snow. What is your favorite accessory? – I don’t really use accessories, but if it were for me to wear, I’ve currently taken a likely to snuggly shawls/cardigans. If it is something else, I would say my hooks are my accessories haha. What is your favorite crafting project? – I certainly don’t have a favourite here. I love everything do too much to choose. 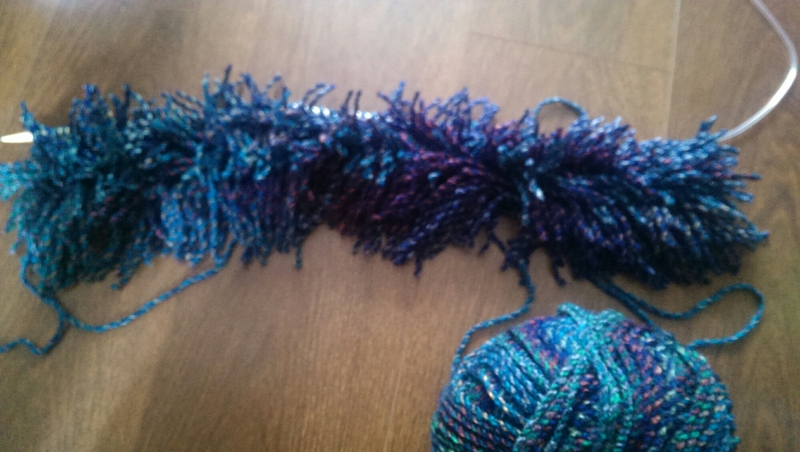 What was your worst crafting disaster? – I think I’m quite lucky so far. 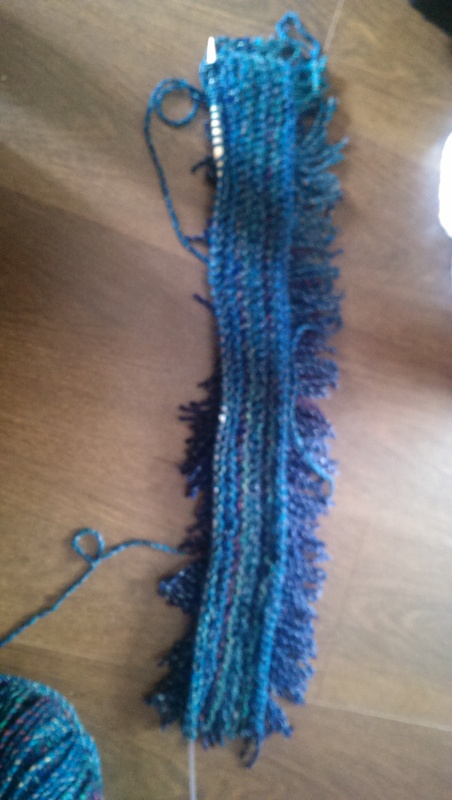 I haven’t had any major disasters *fingers crossed*, only had a few incidents of frogging. If you had a super power, which one would it be? – speed for a time, as I often have to change projects before I get bored of the same pattern etc. Name one item that you cherish the most. – my yarn stash…a stash is one item, right? haha. What is your favorite quote? – I am absolutely pants at remembering quotes or anything like that. The only thing in my head recently is a line off my toddlers favourite show “it’s a bunny…this is a bunny…this?” It is from Masha and the Bear where she is looking at footprints in the snow. Do you have pets? If so, please post a photo! If not, what pet would you like to have if time, money, allergies didn’t come into play? – I would love to have a German Shepard dog again. I had them as I grew up and they are beautiful gigantic beasts. I just adore them. Who or what is your crafting inspiration. What is your favorite way to relax apart from crafting. What is your favourite crafting accessory? 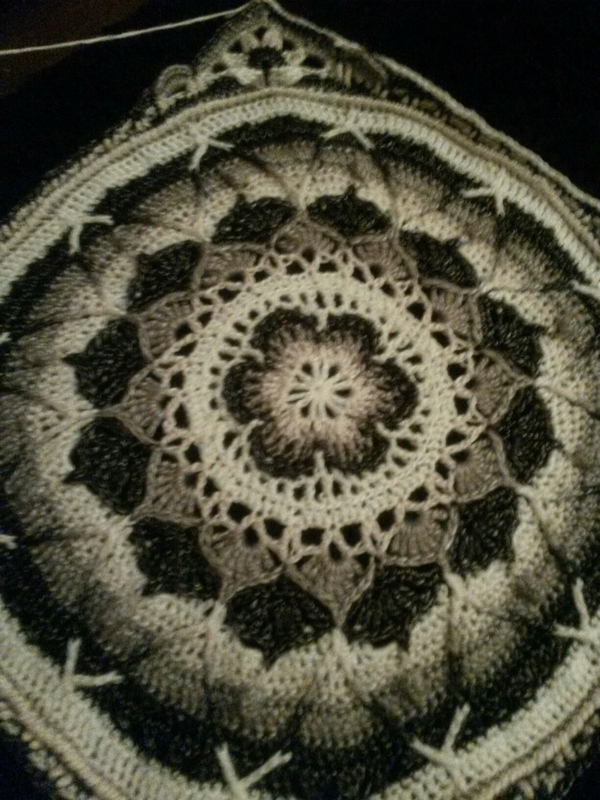 What is your favorite craft (crochet, knitting etc.)? What is the worse thing to happen to one of your projects? If you could no longer do any crafts, what would you do instead? How much yarn do you have in your stash (balls and amount? Would you ever give up your craft? When do you do most of your crafting and where? Do you ever want to teach others to craft? I’m currently sat working away in a balbket ice had in the works for a while now. It’s a knitted blanket, made in squares by Big and Little Knitting Projects magazine subscription. This is a thick, chunky, cream blanket and ice just finished square 23 and so far I have 48 books…which of course means I have some serious catching up to do if I ever want to finish it. There’s even more books to come so I have no idea just how big this thing will be. Honestly it’s much better in real and its not blocked here. 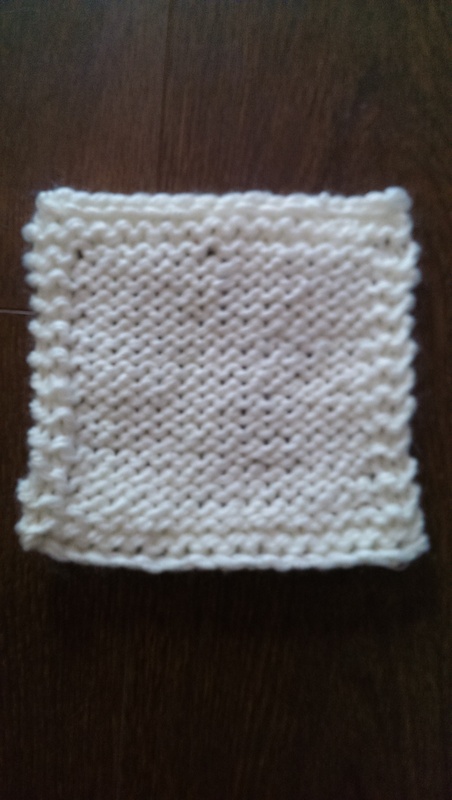 I do have to work on my tension for these squares because they are all coming out at e different sizes, when they are supposed to be 20cm x 20cm. Some are, some slightly off and others a few cm away. I blame the pattern hahaha. Lots of different patterns involved and some tricky ones involved, so stitches get stretched or tightened. Practice makes perfect. I’m sure ill get there. There will be a page set up to show all the work so far and they are also on my FB page – Daisy Designs Crafts. 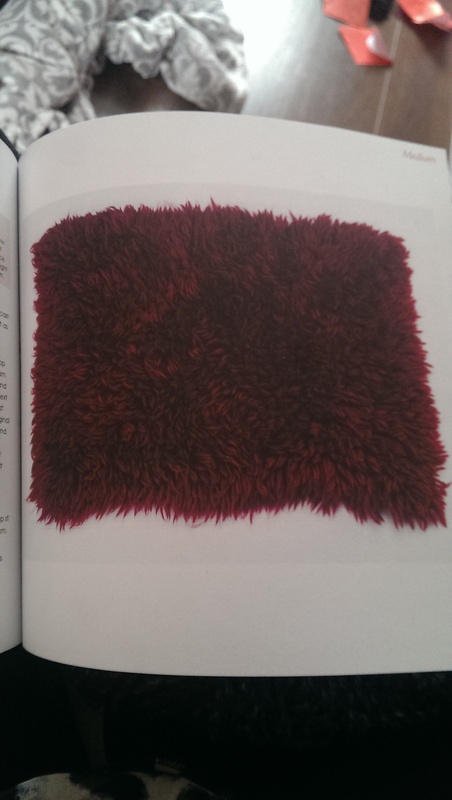 I subscribe to Big & Little Knitting Projects and in books 39 there is a pattern for a fluffy rug, or as they call it, Cut Loop Rug. 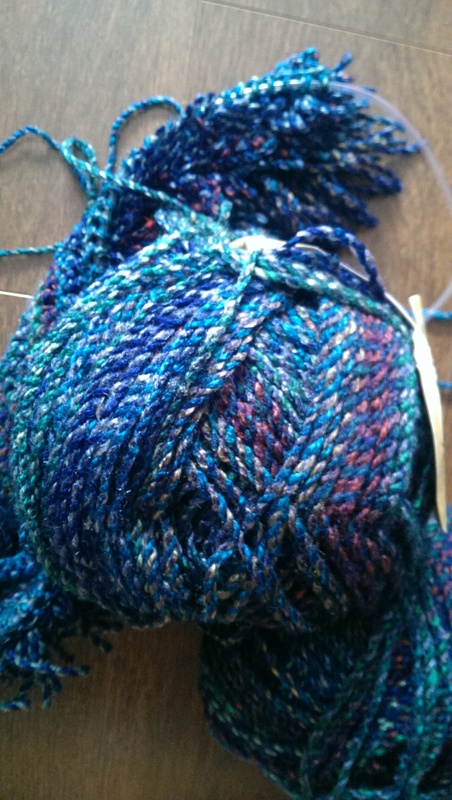 It calls for the use of 25 x 50g balls if Wendy Aspire Chunky in Thistle (shade 3249) and 7.5mm long needles. This is the back, or the part that would be in the floor.